Sitting in the driver’s seat of the car, my forehead pressed against my hands which clenched the wheel beneath them. I was sleep deprived from toddler tantrums at bedtime, my child afraid to sleep alone, and being up several times per night with a baby. I was exhausted and it was only 9:30 am. Even more pitiful, I hadn’t even left the house yet. I was promised there would be more sleep! Why isn’t there more sleep?! Toddler bedtime struggles are real. A recent online survey conducted by Healthdirect Australia revealed that the biggest struggle new parents face is parental sleep deprivation and helping kids sleep. Maybe it’s a late bedtime. Maybe your child is afraid to sleep alone. Maybe it’s early morning waking. No matter your sleep struggle, you are not alone. Readers from all over the world regularly write and share their struggles with me about sleep. It’s challenging to decide what sleep choices are right for your family! 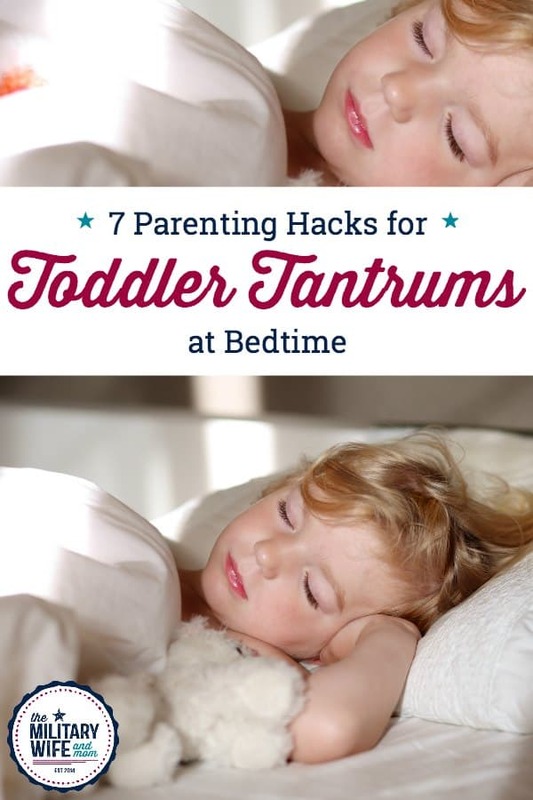 Today I would like to talk toddler tantrums at bedtime, late bedtimes, and practical solutions to help achieve an happy bedtime for your child. What is a time that will work well for your family? For example, if you eat dinner as a family at 6 pm, then 6:30 or 7 pm might not work that well for you. Perhaps, 7:30 pm or 8:00 is more realistic. What time does your child need to wake up in the morning? If your child needs to wake up at 5 am for daycare because you are a working parent, then an earlier bedtime might help your child get the sleep his developing body needs. How much sleep does your child need based on their age and individual needs? Stick with me, I’ll help answer this question next. In our home, focusing on average sleep needs by age helps immensely when making decisions about sleep. For example, if we know that an average 2 year old needs 12-14 hours of sleep per day, it helps us gauge what is a reasonable bedtime for him. If your child needs 10 hours of sleep per night and wakes up at 6 am, then a 8 pm bedtime might work for you. If your child needs 12 hours of sleep per night and wakes up at 7 am, then a 7 pm is likely ideal. Tips to help kids get to bed on time. Essential oils are a great way to create a calm and relaxing mood before bedtime, helping kids wind down. Perfect for toddler tantrums around bedtime. We love to diffuse lavender or peace and calming about an hour before bedtime to set the tone. Some days we place 2-3 drops of lavender essential oil on sea salt and drop into the bathwater to help our toddler relax. Studies show that a consistent bedtime routine helps cue children for sleep, as it initiates the bodies release of melatonin (nature’s sleep regulation hormone). Keep the routine simple enough to complete each night before bed. If you are struggling to get your child to cooperate with a routine, we love using these printable bedtime routine cards. This is a super easy way to help kids feel independent and in-control during the bedtime routine. — Print the bedtime routine cards. —Laminate them using these easy laminating sheets. –Arrange in the order of your choosing. –Hang in the hallway or in your child’s room. –Help them follow along with the routine each night. Anytime you are making changes with sleep, there is often resistance. Resistance does not necessarily mean your parenting choice is incorrect. Change is hard. For kids. For parents. For everyone. Do your research, make a plan, then stay consistent for at least one – two weeks. Then make adjustments and follow your instincts. Based on the printable chart above, decide what is an appropriate bedtime for your child. For our family, 7:30 pm works best for us. It gives our family enough time to have dinner together, have quality family time together, and do our bedtime routines with the kids. This doesn’t mean 7:30 pm is right for everyone. –What time will my kids wake up in the morning? –How much overnight sleep do my kids need? –What is a realistic bedtime given our family’s work and mealtime schedules? There are all sorts of different ways to help kids settle down before bedtime. Deep breathing is one technique I keep in my back pocket when I need it. –Hug your child while in a sitting position. –No instructions are needed for your child. 6. Get out of bed one time rule. This is fabulous technique explored in the book Parenting With Love And Logic. –They may stay awake until they are ready for bed. –Quiet books (or perhaps quiet toys) ONLY in bed. –Children may come out of their room only ONCE to say goodnight and get a drink, go potty, ask a question, etc. 7. The hour leading up to bedtime. The hour before bedtime sets the tone. Dim the lights in your home, turn the TV and all screen time off. This is a perfect time to connect with kids, reading books and doing other quiet time activities. Kids who use screen time before bed are more likely to struggle with bedtime and falling asleep at a reasonable hour. Bonus Tip: Only use a red night light. 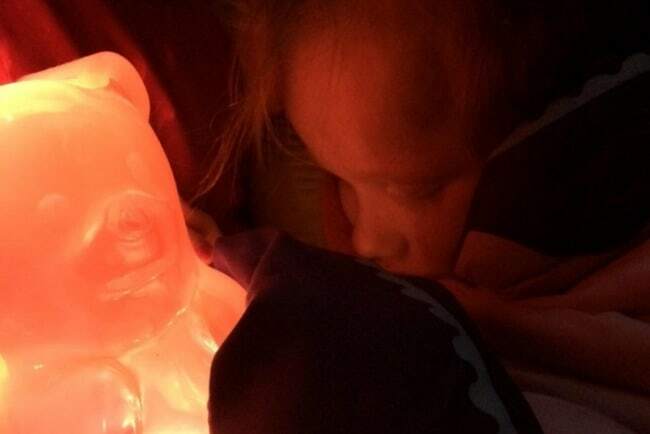 Using a white or blue nightlight is a surefire way to keep kids awake. Choosing a red, yellow, or orange light is better is because they don’t emit daytime light frequencies. Blue, green and white lights send your body “daytime” light messages, making you more likely to stay awake. This Gummygoods Red Nightlight is adorable. Or simply replace your nightlight bulbs with these red night light bulbs. Once you get your child to an earlier bedtime. You might be wondering how in the world to keep them in bed. It’s challenging. There isn’t a perfect solution, but in our home we continue walking our child back to bed over and over again while using calm and reassuring phrases. If you’ve thought it through, made a plan, know your child’s sleep needs, and know an age-appropriate bedtime, feel confident continuing to take your child back to bed. We do the same routine each night. You will see mommy and daddy in the morning. For the first several nights this could take an infinite number of times and it is exhausting. Sometimes there are tears. We stay calm, speak slowly and use a low voice, reminding him that we love him, but it’s bedtime. He protests. We stay calm. We remind him. After a consistent day or two, he is back to a smooth bedtime routine and sleeping at a reasonable hour. I released the steering wheel. As I sat there hanging on for dear life to the steering wheel of my car, a calm washed over me. The baby continued screaming, my toddler continued kicking, but I changed my tone. I decided getting the kids from our apartment on the eighth floor down to the car was enough work for now, and I took the kids back upstairs. I let my toddler watch an episode of Sesame Street. I put my baby down for a nap. And I ate a donut and drank a cup of coffee. 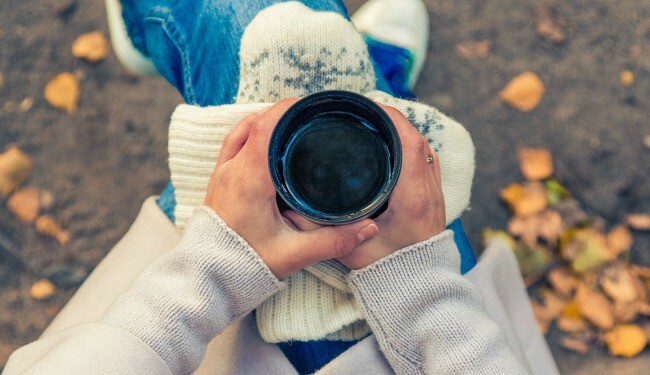 Sometimes you have to forgive yourself, take a breather, and make a plan to get sleep back on track. 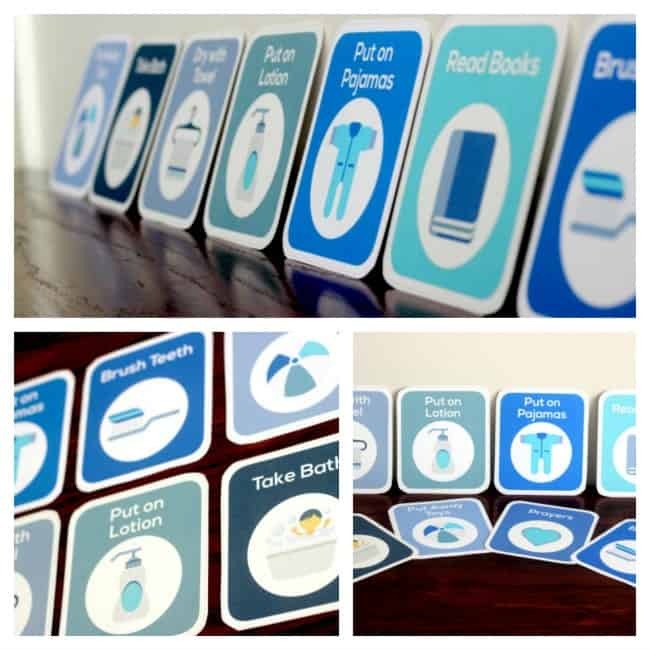 You can find the 40+ printable routine cards we use in our home here. That’s so encouraging to hear you say. Thanks so much! I’m looking forward to having you! If someone thinks essential oil is going to stop tantrums, then they may be sniffing too much of it. I love this! My son will be 3 in a couple months and bedtime has been a huge struggle since about February. Do you have any ideas as far as how to approach not necessarily getting out of bed, but laying in bed yelling and screaming? He shares a room with his younger brother, and either my husband or I end up having to stay in he room until the older one is asleep in order to keep him quiet and keep our youngest asleep. 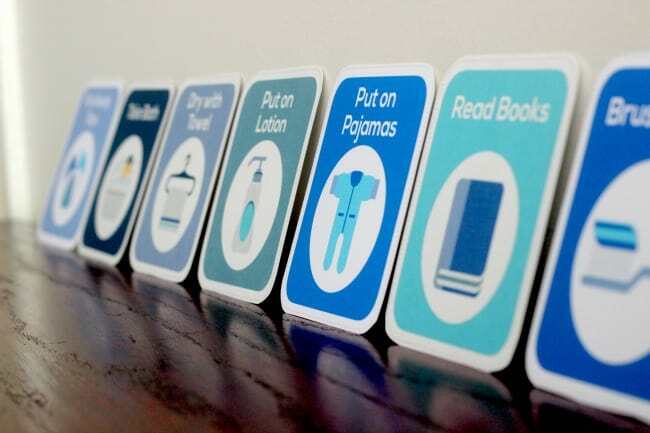 I am really looking forward to using these bedtime routine cards! I am curious about your opinion on this. We have been co-sleeping our daughter (now 25 months) from birth. From 18 months she moved to her room. I get her to sleep by staying with her and pretending to fall asleep next to her. She would wake up 1-2 times per night and we would help her settle and one of us would – in most of the cases, fall asleep in her room for the rest of the night. Before summer she used to fall asleep around 8 PM. In summer, after 9 PM and now we cannot get her back to 8 PM. But now the problem really starts: for already two weeks she is refusing anyone but me, her mother, to fall asleep with. She is waking almost every hour, screaming, or she talks or screams in her sleep. Several nights she explicitly requested to sleep in our big bed or she comes anyway crying somewhere 1 AM. And she started asking for much more milk. She drinks at least 500ml before falling asleep and 500ml more during the night – this is how she does it – wakes up and asks for milk to settle back. Before, she would not finish 500 ml the full 11 hours she’d be asleep. I am pregnant 6 months already and not getting enough sleep really has become a VERY big issue for our family. Any ideas? These are some good tips! We usually do the reassuring calm voice and continue to walk to bed when he comes out, but this evening our son was a different toddler and was histarical over how he wanted to stay up and play. I have a feeling it was due to change in daytime routine and over tired. But it led me to your blog for reminders, good tricks and tips for bedtime. Thank you! Thank you for taking the time out of your busy schedule to share a bit of your story and experience. It could absolutely be from a change in daily routine and feeling overtired. As a good friend always tells me, you know your kids better than anyone. A mother’s instinct is usually spot on. Thanks for the great ideas! I really like the idea of get out of bed one time rule and the deep breathing!! I think we may try those! My son has been an amazing sleeper and napper. He’s also been very well behaved overall. I never would have imagined he would be going though these screaming fits and constantly leaving his room due to “not being tired”. Boy, this three year old stage is challenging! SO glad I came across your article! Thank you!! We are struggling pretty severely with a good sleeper turning awful while we transition to a bed. It’s only been a few nights and we are trying to be consistent with walking him back to him room quietly and calmly but he is really persistent and resistant. He has put up a fight for an hour or so each night and then finally gone to sleep but no without many tears. We are strapped for a more calm, positive way to do this but nothing else has seemed to work i.e., laying in his room while he falls asleep, doing check-ins, etc. All that is just venting – what I really wanted to say was thank you for your post. Thank you for your honesty. Thank you for writing some words I needed to read tonight. Much appreciated. I really enjoyed the read but it still solve our problem. My wife and I have 3 year old triplet girls that are all in the same room. We have one that is the leader of the pack and she loses her temper when we leave the room. So much to the post not that she sounds as if she is going to vomit and gives herself those hyperventilating type breaths. She is not satisfied unless I lay in her room with her. If she wakes while I am making my exit she loses it. The other 2 will follow her lead, but are much easier to get down for bedtime. I will admit that our patience is being tested, but it breaks my heart to hear her screaming at the door. I am actually typing this from the floor of their room as I am using the Dumbo stuffed animal as a pillow…..send help. Les, having 3 girls share one room is a real challenge. You’re exhausted from just everyday parenting and then the sleep issues are taking it to the next level. It takes a seriously dedicated dad to use Dumbo as a pillow while reading blogs to search for a sleep solution. Powerful! If you’re struggling with getting your daughter to peacefully sleep alone, Success Training is powerful. Start by offering to let your child set a time for you to check on her (like in 2-5 minutes) so she can experience success in staying alone and in bed, set a timer, and return on time a couple of times. Each time point out a STRENGTH — any little thing she did right–you didn’t move (stayed under the covers, on your bed, in your room like you said below) that whole time! After a couple of successes, point out that shows she trusts you to come back noting how long she stayed in his bed and how hard that must be since this is a new routine. Then see if she is ready to try another minute between visits (or 2 or 5 depending on how quickly she is adapting to this new routine), and try that a couple of times. Keep checking and extending until she is asleep. The first few nights it will take a lot of your time, but you should see progress every night, especially since she is so young. As your child’s confidence grows, she will choose a longer time between visits, and you will know she is on her way to going to sleep on her own without a tantrum. If she comes out before the time of the visit, she may not believe you right away or may be worried you is tricking her. If so, you should adjust the time down until you find the success point and start or restart there. It may go back a forth a while at first before seeing steady progress. Okay, i’m struggling to find a little bit of sanity with my two boys, ages almost 4 and almost 1. I’m a stay at home mom and the oldest wakes up between 6:30 and 7:30. If he needs 12 hours of sleep then he needs to be in bed by 6:30 pm…. there is no way I can make that happen! I just wanted to say thank you. We are literally dealing with this right now and a) it’s nice to know I’m not alone and b) your tips are great. Say a prayer we can all get some sleep around here! Misery loves company. My great sleeper who turns 4 this week has been having complete meltdowns at bedtime for the past 3 weeks. She wakes up her 2 yr old sister. Our routine hasn’t changed and my husband and I are at a loss (and exhausted)as to why this is happening. We have tried staying calm and it doesn’t work. Getting heated doesn’t work either. We’ve tried every time of punishment there is because we are beyond frustrated at this point. She is currently reading in her bed and I’m hoping your “1 time up” works. We’ve been going through hell the past couple of weeks as well with our 4 year old and we don’t have any idea how to help him. Any suggestions would be greatly appreciated. Thank you so much for sharing. I can really relate to everything you said and it’s comforting to know I’m not alone. Hang in there. I’ve got a two year old little boy who is REALLY good at escaping his crib. Unfortunately, we can’t let him roam free in his room, as our apartment is so small we have some things in there that, 1 – it’s stressful for him to make a mess of, and, 2 – isn’t safe for him to be constantly messing with. So, we’ve done pretty much everything we could think of or research that’d apply, and nothin’. He still climbs on out. Which led me here, through a few various links. So here I am, along with everyone else with active toddlers goin’ insane… Heh. Hello- My niece’s 3 year old has major tantrums at night, waking up from sleep. Last night she went to sleep at 9:30 and woke up at 11:30 screaming. She broke the toddler handle on the door, so my niece could no longer contain her in her room, so that she kept coming out of her room. She screamed so hard, she threw up on her bed. When she finally got to sleep, it was only for another few hours, and then was up the rest of the night, as was her tired Mother. Suggestions? She has spoken to the doctor, who tells her to tough love it out, but this has been happening now several nights in a row.